It is very important for a pet owner to know how to cut his/her dog’s nails without having to face blood, pain or aggression. In this step-by-step guide, we will tell you exactly what you need to know in order to keep your dog’s nails well groomed. If your dog is well exercised and walks daily on hard surfaces, then the friction will naturally trim its nails. However, if your dog is not used to walking much, or only walks on grass or soft earth, then you need to trim its nails every now and then-preferably once in 2 months. Dogs’ nails grow rapidly and if you are not sure how to trim them without harming their delicate structures, then you must visit the vet or a pet grooming center. 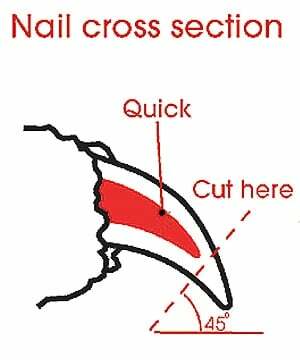 This is an important step to ensure you cut only the hard part of the nail and not its inner soft tissue and skin which could lead to massive bleeding. Here is an image of dog nail structure. As shown in figure, you must take care not to cut the inner soft tissue of the nail. The anatomy of a dog’s nail consists of the outer hard part and the inner soft area called quick. The quick has nerve endings and blood vessels. If you are new to dog nail clipping, make sure you check the nail as you trim it to ensure you are not close to this dark part of the nail. This dark region denotes the quick which you must not touch at all. Dogs tend to play the prima donna with their owners. If your dog has you “firmly wrapped around its’ paws” then it is best you leave the task of nail clipping to the experts. Expert dog grooming facilities have special tools and they could even muzzle your dog if it starts to get aggressive. If your dog has the tendency of biting or jerking away its paws while you attempt to trim its nails; it could lead to severe injuries for both you and your pet. Trimming dog’s nails can be much easier if you train your pet to get accustomed to the process from an early age. If you have a puppy in your home, start training it to sit still while you cut its nails. Get your pet to hold out its paws so you can gently touch it. Let the pet get used to your touch. You can then progress to pinching it gently on the nails. Should s/he allow you to do this, reward it with treats. F you are a beginner to trimming dog’s nails, start slowly and trim only a bit in the beginning. This will reduce the chances of hurting your pet. Talk in a soothing voice and give the pet plenty of treats and praise for allowing you to do this. This will help her/him get used to the procedure. Start by investing in the right type of pet nail clippers. Seek advice from your vet if needed. Dog nail clippers are of different kinds- the guillotine clippers are ideal for smaller breeds while strong claw cutters may be necessary for larger breeds like hounds and mastiffs. You might even need a nail file with a jagged edge to trim the pet’s nails but most pets do not allow its use. So invest in good quality clippers and you are pretty much set to clip your dog’s nails. Get the dog to lie down on a raised surface. If your dog starts getting aggressive, it is best to muzzle it. You might even need someone strong to hold the dog so it does not jerk. Position the tool in the right place. You might even need to read instructions that come with the product. In case of guillotine clippers, you must clip underneath and upwards from the claws. Make sure the dog is still and not wriggling. Start by making tiny nibbles with the tool of your choice. In case of dark nailed dogs, you must be extra carefully since the quick is not visible. So make sure you only take off small bits. As stated above, lesser is better when it comes to clipping dog nails. Simply trim off the bits that protrude over the paws. Repeat the procedure for each nail. Do not forget the dew nails-these grow on the dogs paws. If you accidentally cut into the quick, the nail might start bleeding. Bleeding could last for several minutes, so do not panic. Wipe the blood off and cover it up with a piece of cloth or tissue. Styptic pens can help staunch the blood flow- so keep one handy as these do not hurt the dog and can quickly stop the pain. Do not let your dog lick the paw as it could cause infections and could even increase the bleeding. Even if you cut your dog’s nails at home, it is important you get its nails and paws examined by a vet every few months. This can prevent many complications and give the vet a chance to remove ticks, and other parasites hiding in those areas. Cut your dog’s nails from time to time to avoid nail bed infections, ingrown nails and other serious complications which could impact your dog’s walking. 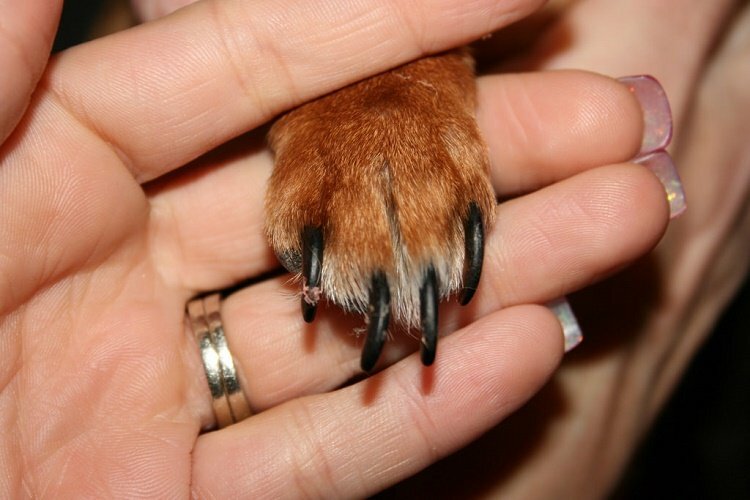 Regular nail care and maintenance will ensure that your dog remains healthy and active for a long time to come.